A child of the 60's and 70's, my art was influenced by artists of these years. Formed in an environment, that had no limits. The fences, that had retained, artistic freedom had been destroyed. Like a wild horse, let free. Artists were set loose, racing forward sometimes with out control. The boundaries of expression were shattered. It was by the times and by the hand of God. 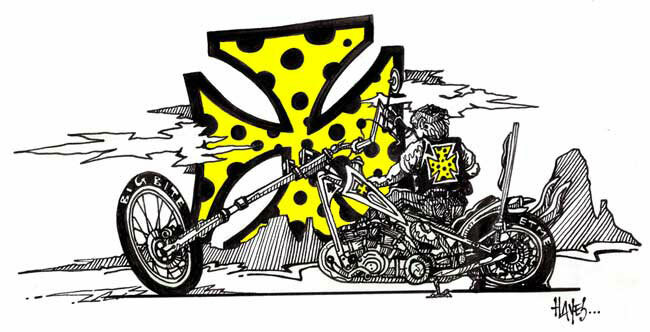 My love, my passion for custom bikes and car illustration was born - Cheese Head Choppers a company dedicated to custom cars, bikes, and art. Born from the freedoms of days gone by - now reborn. We here at Cheese Head Choppers, hope you will join us, hope you will ride with us, on the tidal wave giving birth to a legend.